What to do with that 5-pound behemoth of a zucchini that eerily resembles a lethal weapon wielded by an ogre in a Grimm’s Fairy Tale? Grate that puppy up and make zucchini bread. Lots of zucchini bread. Call it fate, kismet, destiny, luck or simply that it’s summer and everyone has at least one or two zucchini cudgels hanging about the kitchen, the recipe mentioned over at The Bear and the Blackberry for zucchini bread came just at the right moment. My tweaks were to reduce the oil by half and add unsweetened applesauce; reduce the sugar from 2 cups to a 1/2 cup (and I used maple sugar) plus stevia; add chocolate chips and change out the walnuts for pecans. This cake is absolutely addictive. It’s so good I’m looking around for an ogre who wants to unload an outsized zucchini or two. The little beauty of a recipe above for dairy-free, no-bake cheezcake comes from Somer at Good Clean Food. Pure friggin’ genius. Never a traditional cheesecake fan, I tried this simply because it fascinated me – and I ended up loving the results. The secrets are cashews and Pomona’s Pectin. Soft and creamy with a little bit of lemony tang and then sweetness from the blueberries – you get the true cheesecake experience without a ton of sugar and scary dairy. I messed with the crust, using pecans instead of almonds and adding chia seeds and orange zest, but the only change I made to the cheez (other than coming close to complete disaster because I tried using a food processor for the whole thing rather than my Vitamix…) was to reduce the maple syrup by half and add a little bit of stevia. When you visit Good Clean Food to get the recipe (and you simply must get the recipe), note how much thinner Somer’s slices of cheezcake are. Oops. I followed Nihacc’s link to this easy recipe and played around with it a little bit, changing out some of the ingredients and adding some here and there. My take on it is below, but I encourage you to check out Nihacc’s mouthwatering breakfast blog (imagine: something different each morning!) as well as the blog she cites (The Sunny Raw Kitchen). Line a 9″ x 9″ pan with parchment paper. In the bowl of a food processor, finely grind the almonds. Add the dates, cherries and ginger and process a few times just to break everything down. Add the remaining ingredients and process until everything is in small bits. If the mixture is not coming together, add a tablespoon or two of water. Dump the mixture into the prepared pan and gently spread and pat it out until it reaches all sides and is fairly even. Place in the refrigerator for a few hours before slicing. I wrap mine in parchment paper and store in the refrigerator. Just so I don’t neglect the beverage side of things: here’s a fruity-sweet peach and black tea drink from Compassionate & Passionate Cuisine. Since I just happened to have a boatload of fresh peaches hanging about, I couldn’t NOT make this (immediately) after reading her post. Oooh the tweaks you made to that zucchini bread sound and look delicious! 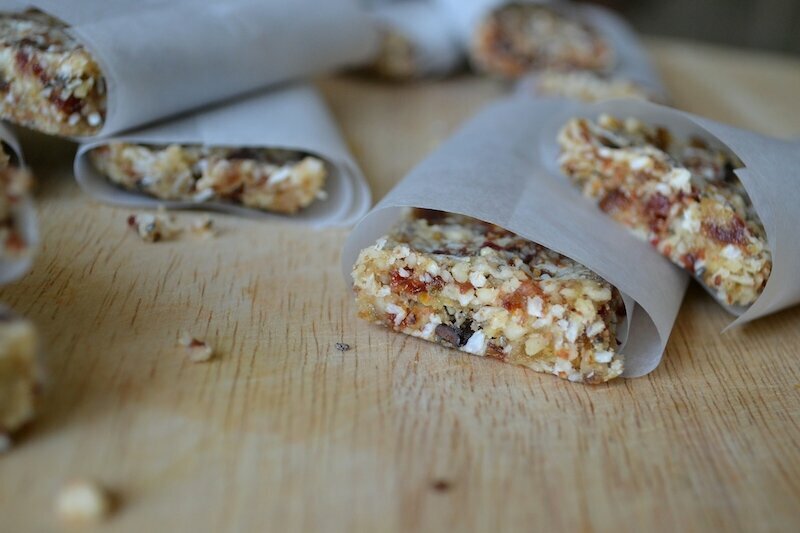 And those date-cherry-ginger-magigs…. mmmmmm… must try! Your Zucchini bread recipe came along just too late for daughter Clare, who found herself with a surfeit of the little chaps earlier this week. Does sound delicious, though, so will forward it to her (by the way, she posts on Facebook at very regular intervals (surname Rickett!) You may have noticed her on my pages! I’ll look for her posts, Isobel. Yes, neighbors keep giving us zucchinis and cucumbers. Sigh. It’s nice, but, after a while, it gets – let’s say – challenging! Everything here looks absolutely amazing, and as for lemon and blueberries, that’s a match made in heaven. True, my friend, very true. I’m ready!! The cool thing is they are infinitely tweakable! You’re welcome! You always have yummy recipes :-). I should never look at this first thing in the morning! Well, maybe I should but I wish someone would just hand it to me with my morning coffee. Haha! That would be nice, wouldn’t it! I just looove when you do posts like these! So many great ideas and I love hearing how you modify recipes to suit your taste! Ohh my goodness a baking day! All this stuff looks amazing! I have never been a huge cheesecake fan either, so I’d be curious to try this cheezecake! YUM! It’s so much better than cheesecake. You get a nice nuttiness with just a little tang. That cheesecake, drool. And that zucchini bread! I’ve got a ridiculously large zucchini lying around – and chocolate chip zucchini bread sounds so, so good. All of these recipes look so good, especially that cheesecake! I’ve been on the lookout for a dairy-free cheesecake that just doesn’t replace the cream cheese with soy cream cheese. Exactly! You’d never guess that the bulk of this cheezcake is cashews! Forget about the cheezcake (although your version and the bigger slices are making me want to make it again, with your chocolate suggestion, mind you) The zucchini bread is one I’m going to have to make into muffins, and I mean, right now. I have some ogre sized ones in the fridge begging to be made into this! And those breakfast bars, it’s like the fabulous spread you emailed me. in a bar form. with cherries. Stop it! It’s a side bennie no one talks about – eating plant-based makes one psychic. love love love these photos… and I am sure the food will be just as good! Question where would i get crystallized ginger? Hi Billy – you can find it at almost any grocery store now – where the other sweeteners are. I use Truvia, but there are lots of other brands as well.